The U.S. Army Corps of Engineers project is expected to begin within the next two months. It will change our local beaches forever, with vegetated dunes and engineered beaches that will be better protected during storms. But what about the details? Before the $90 million project begins, we thought we’d fill you in on a few facts, courtesy of the Corps itself. 1. The project will send millions of cubic yards and sand through pipes, miles out in the ocean, right onto your street’s beach! 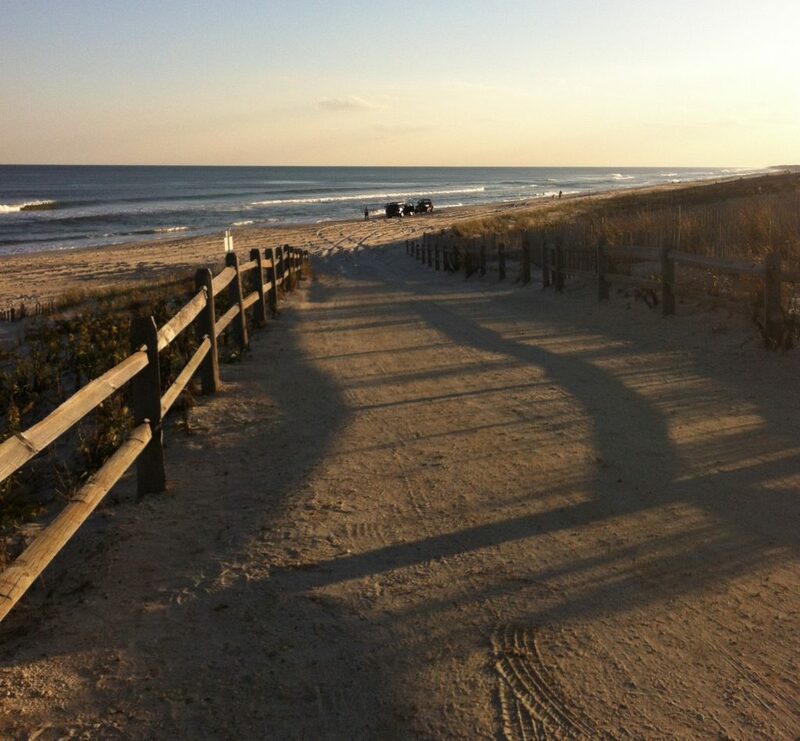 The project, once fully completed, will cover approximately 14 miles of coastline along the Barnegat Peninsula in the communities of Point Pleasant Beach, Bay Head, Mantoloking, Brick Township, Toms River Township, Lavallette, Seaside Heights, Seaside Park, and Berkeley Township. More than 11 million cubic yards of sand will be dredged from approved borrow areas and pumped through a series of pipes onto the beaches of the municipalities. 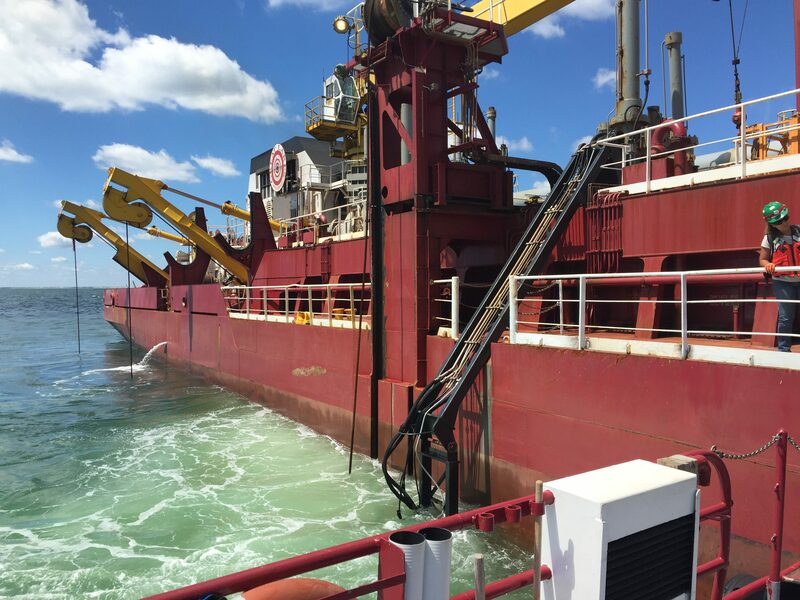 Last summer, we took a tour of one of the dredge boats working the Long Beach Island project to get an up-close view as to how things work. 2. Where is the sand coming from? Will it match the color and grain size of the existing sand? The sand will be coming from several offshore “borrow areas.” The identified borrow areas are chosen for their compatibility of the sand with the existing sand on the beaches. The Army Corps goes through an extensive process (they also work with the state Department if Environmental Protection) to find these sites and gain the environmental approvals to use them. The process includes physical sampling as the Corps seeks to closely match the grain size to the “native” sand on the beach. Sometimes, the sand pumped onto the beach may initially appear to be a darker color as it has been buried unexposed to sunlight. Once exposed to the elements, this disappears quickly and the material will match the existing sand. In a previous project on Long Beach Island, the sand began to appear white (like the sand that was there before it) after about a week or so. 3. Yes, the sand is designed to erode after construction. Because the Corps cannot reliably place material under water in the surf zone, officials know that the profile will undergo an initial adjustment to reach the natural equilibrium profile of the beach. “We expect Mother Nature to erode some of the berm in the first year, which is why we build a post-construction template much wider than the designed template,” the Corps states in a fact sheet on the project. In addition, the project includes scheduled regular “periodic nourishment” every 4 years to add more sand into the system to maintain the design profile over the life of the project. 4. 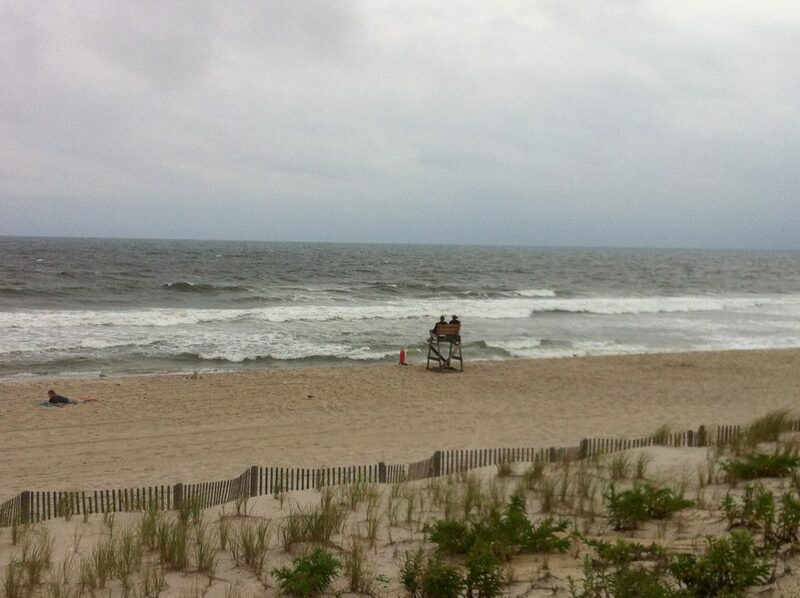 Dune crossesovers will replace cut-throughs to access the beach. The Corps’ contract includes the construction of “dune crossovers,” which are built over top of the dune as opposed to “through the dune.” This way, the entire coastline is protected and there is no place where water can funnel its way through during a storm. These are typically built in the same locations as existing access points. Additionally, the Corps is building ADA-accessible dune crossovers and vehicular dune crossovers in certain locations based on coordination with the non-federal sponsor (NJDEP) and the local municipalities. The pedestrian crossovers are topped with a hard-pack clay-like material, which is easier to walk on. The crossovers include fencing to assist with keeping people from walking on the dunes, which damages the stabilizing dune grass. 5. There will be dune grass (two kinds of it!) galore once the project is completed! The beach replenishment contract includes the plantings of Cape American Beach Grass and Spartina Patens. This is done during the winter timeframe when the plants are dormant. Existing vegetation on the seaward side of dunes will likely be covered or removed; however the contractor will try to avoid impacting existing vegetation on the landward side of the dune (depending on location). 6. Your beach will only be affected by replenishment for a couple days – and you’ll only have to walk a block or two over to swim and sunbathe. The exact amount of time a block of beach is closed depends, in part, by the quantities of sand required to build the engineered dune and berm template. Some areas require substantially more sand than others, which impacts the amount of time to complete beachfill operations in certain areas. However, typically the contractor advances 100-300 feet per day depending on weather, dredging production and other factors. During construction, communities can expect the construction crews to close no more than 1,000 feet of beach as work progresses along the island (closed sections are “rolling” and advance as the beachfill progresses along the island). That’s 2-3 blocks max. 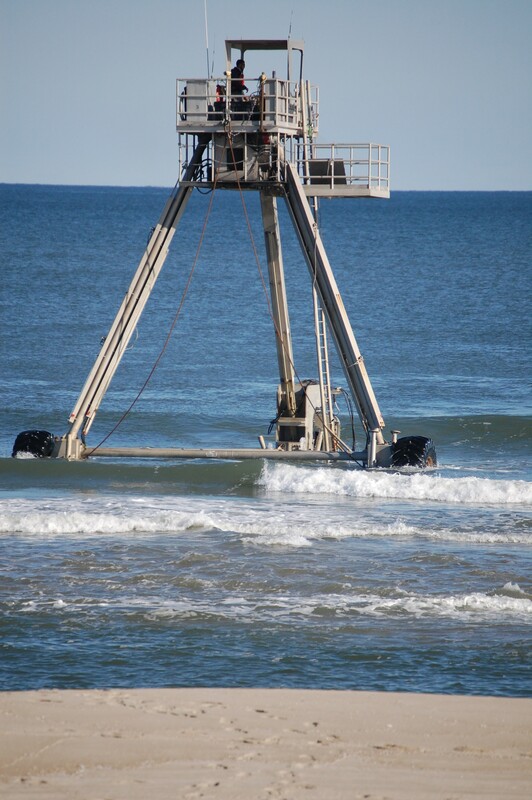 The cool part is you’ll get to see crazy looking equipment like this “CRAB,” which goes out into the ocean to measure the height of dunes and sand from the ocean floor itself! 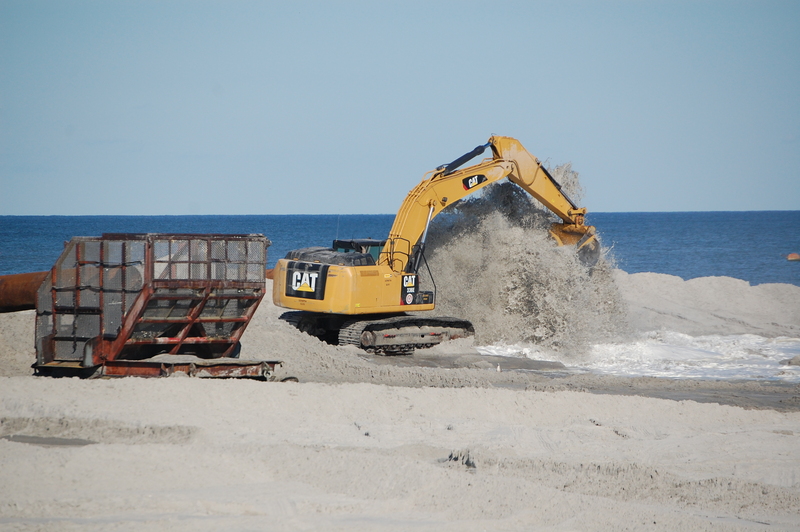 Beachfill operations require ground equipment (bulldozers and other construction vehicles) to move pipes and grade the sand into the template. Residents and visitors in the immediate area are likely to hear different aspects of the operation such as trucks moving and back up alarms going off. However, work does progress along the island and the noise dissipates. From past experience, we can tell you that you (generally) can’t even hear much of anything more than a couple houses from the ocean. There is a dune there, after all. Residents and visitors may feel some vibrations near the construction site at different times. The Corps’ contractor uses vibration monitoring seismographs to ensure that vibrations remain below the prescribed threshold that could cause any structural damage within homes. 8. There’s a good reason work does, in fact, have to take place during the summer. And updates are provided to help plans trips to the beach. A large project means a large contract, for which the Corps has to provide private industry with an ample amount of time to complete the work. Inevitably, some of this work, at some locations, will take place during the summer. If the Corps didn’t provide enough time, it risked receiving bids that were too high for us to consider (taxpayers tend not to like that sort of thing), or receiving no bids at all. It’s also important to note there is a limited number of dredges that can actually handle beachfill operations like this. So if the government specifically excluded summer work, it again risked pricing itself out of the bidding market and not being able to build the project at all.